You can build an extraordinary career aligning yourself with a 100% commission real estate brokerage firm. 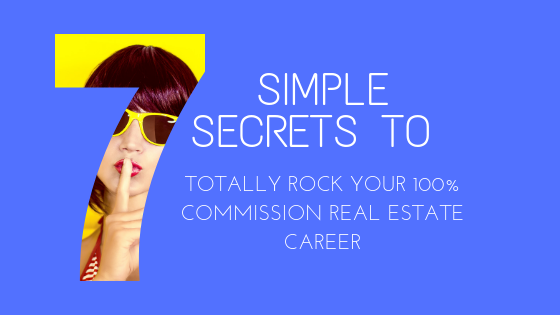 You can totally rock your 100% commission real estate career by knowing and implementing, these 7 simple secrets. Anyone who works for themselves understands the importance of reinvesting in their business. While pocketing that extra 25% or more in commissions can be tempting, commit to reinvesting some of it in ways that will help you to continue to grow your business. Perhaps a faster computer, a more capable smartphone or Customer Relationship Management (CRM) software. Invest in a website and professional Search Engine Optimization (SEO) or Google Ads. Even upgrading your wardrobe or workspace can help. Reinvesting in your business will pay dividends both in the short and long-term and there are tax benefits to doing so. You already know the real estate industry is competitive. When you are building your 100% commission real estate career, you need every advantage you can get. That means knowing more than your competitors. When you expand your knowledge in commercial real estate, investment properties, and even property management, you are able to assist a wider range of clients more competently. You are less reliant on others. Clients will seek you out for advice. When “farming” neighborhoods, know everything you can including potential zoning changes or planned housing or commercial developments. Learn where roads are being widened and where there are other infrastructure changes planned. Know more and earn more. Most agents enjoy helping clients and making “the deal.” Paperwork, returning phone calls and detail work may not be your strong suits, however. Recognize where you could use help and begin adding to your team. This could include adding someone to prospect or develop leads. It may involve getting administrative help to handle paperwork and schedule appointments. When you are connected with a 100% real estate commission brokerage the sky is the limit and building a motivated team can help you soar to new heights! One of the biggest challenges in real estate sales is that while we may have sales or closing goals, those closings are relatively infrequent. It can be easy to become disenchanted when a promising lead doesn't develop or a sale falls through. That's why it is critical in developing your 100% commission real estate career that you set progress goals for every day, week or month. These are goals for the things you know you should be doing, but can sometime put on the back burner. Set goals related to the email inquiries you receive, the number of leads you develop, calls you make or showings you schedule. Look at all of the tasks it takes to lead to a sale or closing and set markers for each. If you achieve those goals it should lead to more closings and sales. In addition, you will be more motivated as you achieve each of these goals. There is a saying that states “Knowledge is power.” We have since learned that the use of knowledge is real power and that includes sharing that knowledge. When you share your knowledge with potential prospects and leads, you position yourself as their “go to” resource. They will look to you for information and the answers to questions they may have when it comes to real estate. This is a valuable position to hold. How do you place yourself and build a reputation as an expert? Make yourself available to local media when it comes to local real estate news. Start a blog or add real estate tips to your social media. Ask and answer questions through an email campaign. Create press releases about local real estate developments. Speak to local civic groups. Offer to be a guest speaker at a local college that teaches real estate related courses. Many “experienced” real estate professionals will keep what they know close to the vest. Become more and more knowledgeable and don't be shy about sharing your knowledge. Building your career with a 100% commission real estate brokerage firm can benefit tremendously by your involvement in your community and the industry. This means attending important conventions and industry conferences. It involves joining local civic groups, volunteering and even sponsoring projects. Getting involved extends your reach, improves your network and increases your visibility. As a 100% commission real estate professional it is time to take responsibility for how and how many people you can reach. Getting involved is a terrific way to rock your career. As a 100% commission real estate professional there's no obligations or commitments to a broker for advertising, floor time, or meetings. When you are successful, this means more “me” time including vacations. Vacations are important to rejuvenate and relax. They offer an opportunity for you to clear your mind and discover potentially valuable ideas to jettison your career forward. As a 100% commission real estate professional you should have more resources and time to take much needed and deserved vacations. If you are in search of a 100% commission real estate brokerage firm in Southern California to rocket your career forward, we invite you to contact us. Get the resources you need without expensive or time-consuming obligations and commitments. Contact us to learn more.